George W. Bush’s presidential campaign promised “compassionate conservativism.” He promised to lower taxes while caring for the poor and needy. He wanted to reduce government regulations and ensure individual freedoms. His agenda changed after 9/11 though. Crushing terrorism became a major concern. Bush remained a popular president and won a second term. As the war against terrorism dragged on with little success, Americans began to grow weary. Bush’s tax cuts drove up the federal deficit and the nation headed into a recession. In 2008, Democrat Barack Obama defeated presidential candidate, John McCain, to become the first African-American president in America’s history. Obama was young, charismatic, and well-educated. He promised quick action to restore the nation’s economy. Obama made several changes to boost the economy. He lowered interest rates to encourage Americans to get loans and offered programs to help Americans who already owned homes. One of Obama’s most controversial moves was the Affordable Healthcare Act, which promised health insurance to all Americans. Liberals appreciated Obama’s views on abortion, gay rights, and the environment. Conservatives disagreed with many of his values and worried that he was destroying individual liberties, and in particular, religious freedom. Terrorism continued to be a problem throughout Barack Obama’s presidency. Some people felt that he didn’t do enough to quell rising terrorism. Question: Did the economy improve during President Obama’s term in office? Answer: Most people would agree that the economy did improve during Obama’s presidency. 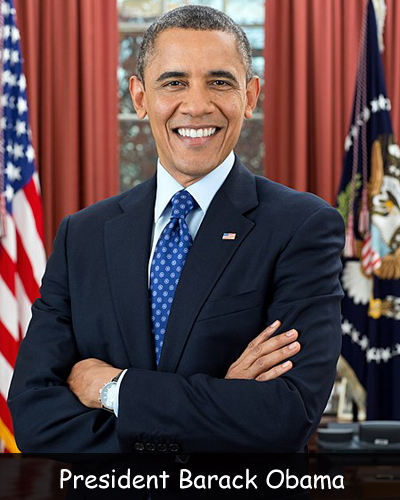 Visit Wikipedia to learn more about President Barack Obama. Declan, Tobin. " Facts about President Obama: America’s First African-American President ." American History for Kids, Apr 2019. Web. 22 Apr 2019. < https://www.americanhistoryforkids.com/president-obama-americas-first-african-american-president/ >.